Putting together a fantastic run to end the season, the No. 2-seed Florida Gators fell just short in the Southeast Regional Final of the 2011 NCAA Tournament, dropping a heartbreaker 74-71 in overtime to the No. 8-seed Butler Bulldogs. 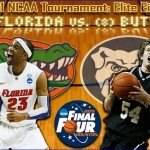 It was the first time in school history that the Gators fell in the Elite Eight and did not advance to the Final Four. The teams’ coaches and players spoke with the media following the contest, and OGGOA has compiled the most important news, notes and quotes for you to peruse below. 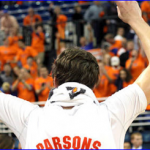 Saturday’s loss was devastating for the entire Florida program but perhaps no one more so than the team’s trio of seniors – forwards Chandler Parsons and Alex Tyus and redshirt center Vernon Macklin. DONOVAN OUTCOACHED STEVENS, NOT OTHER WAY AROUND? VIDEO: See handshake, final one-fourth of the clip. What is lost in the rush-to-judgment opinions and extreme calamity about Florida’s final shots are two facts: (1) A team was on the floor defending them so the Gators could not do whatever they wanted, and (2) The execution of each play was not necessarily how Donovan drew it up. To conclude regulation, junior point guard Erving Walker was supposed to try to penetrate and either draw a foul or kick the ball open to someone for a potentially shorter jump shot. At the end of overtime, sophomore guard Kenny Boynton should have taken it to the hoop rather than launched a deep three. [EXPAND Click to expand and read the rest of this post. ]WHAT HAPPENED TO MACKLIN? By all accounts, Macklin had a dominant game for the Gators in the post. However, three early fouls and a fourth tacked on exactly two seconds after he returned with 9:02 to play in the second half made him ineffective. His free throw shooting down the stretch also made him a liability that Florida could not gamble on in the clutch. Sad for the kids, but they really could not be considered underachievers. They probably ended near where they should be on talent alone ( luck notwithstanding). So Adam – did the Baseball team drop off the face of the earth, or no games during spring break? Heckuva season Gators! I told everybody before the game, no matter what happens–I am pleased with how far Billy D and these boys got this year. I honestly didn’t expect to be in the Elite 8. But I love the effort from these guys. This team could play with any team in the country, no doubt about it. Amazing season, Go Gators! Very confusing statements by Donovan. He says Walker was supposed to drive and try to draw a foul or kick the ball out at the end of regulation. Then he says “We got Walker a great look: he told me had a great look and was really wide open”. Really! I’ve seen church league teams with a better one shot end of game plan than what I saw yesterday. Pitiful. Very selfish plays by Walker and Boynton. Tyus’s post game comment confirms it. Most athletes are selfish. They always feel like they can make the plays. That is what makes them so competitive. Our boys were ranked 10th? preseason. That’s how they finished. It hurts SO much because they care SO much! I’m proud of our boys. I will miss ’em as much as I miss our past players. This loss hurts because we were the better team. What cost us wasn’t the poor shot selection at the end, it was our two most consistent offensive players, Parsons and Walker, combining to go 3-19 from the field. Parsons simply played awful in that game. Still, if you would’ve told me we’d make the Elite 8 after we lost to JU and UCF I would’ve laughed. Great coaching job by Billy of getting these guys to come together and play as a team. They were a lot of fun to watch down the stretch this season and in the tourney. Great job fellas!! Were we the better team??? Everybody forgot that Butler played in the National Championship game last year and lost to Duke by just a couple of points. I have a good friend who is a Butler grad. He thought his team’s chances returning to the Final Four was great. Personally, I think that they were indeed the better team with the tournament experience. Here’s hoping that the tournament appearance helps in recruiting. Thanks for a great season boys!!! I am surprised at some of these comments. If Walker had made that three, you all would be praising him for his guts to take such a shot. But because it didn’t go in, all of a sudden he is selfish? Come on folks. And then to question the coaching? Maybe those of you who are making these comments should check yourselves. I am positive none of you have ever been in a game with as much presure. So take a breath and be proud you are a Gator instead of spewing this nonesense. Thanks Adam for your hard work on this site. GatorJohn- You’re welcome. I think a lot of the push-back is not just with Walker’s shot but the fact that it happened again in OT with Boynton. Seeing it once is one thing, seeing it twice can be extra frustrating. But people forget the play called for Parsons at the end of regulation in the BYU game. Understood. But both Boynton and Walker hit 3s in overtime to keep us close. Walkers even gave us the lead. These are the shots these guys are capable of and their confidence was high after making those shots. I just want to echo the comments on hear congratulating them on great season. This team fought hard all year, and even though this game was a tough loss, I’m happy with how far they made it. I agree 100%. Go Gators! All the brackets will be blown if Kentucky can finish against UNC.. Apparently, 2 out of the whatever millions of people that do brackets on ESPN got the final 4 right. 2! I still think that’s a huge number, who honestly picked VCU, Butler, UK, and UConn? I think these 2 people should be interviewed on ESPN this week. Some of the guys who helped get us there didn’t have a good game Saturday. You need to be on all cylinders at this point and we were not. I agree…..Parsons & Walker had an off shooting night or we would have won easily but we still had an amazing season and even though the brackets fell our way and we blew a Final Four that’s what makes the tourney so great….Butlers coach said it best…it could have been Old Dominion and not them…..Butler has caught some amazing breaks…..most runs involve one or two keys plays in the case of Butler it has been several almost every game…..I thought where we really lost the game was in the second half we had a stretch of no offense that really let them off the mat…and as far as Walker taking the shot so what…I wanted Parsons or Boyton driving to the basket but regardless if it works the coach looks brillliant if it doesn’t most say it was a horrible call….but we still had a great year!!!! Thanks to the team and coaching staff for a great run!!! I live in Kentucky. This is the worst time of year to work in Kentucky and be a Florida fan. But the silver lining is and always has been – as soon as basketball is over, we get to move onto an exciting spring training. None of the other Elite 8 teams can say that. So let them run the course – its all they get until next basketball season. Thank you Seniors for a great ride. Most definately didn’t let anyone down.